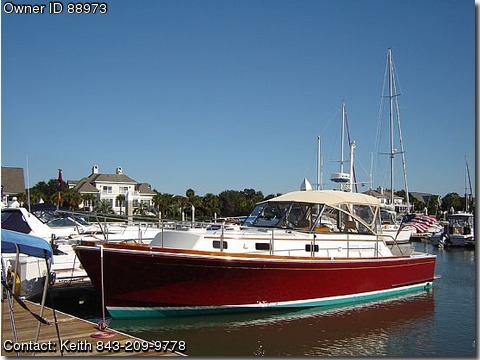 1998 38' Grand Banks Eastbay with Claret Red Awlgrip hull. 817 hrs on Caterpeillar 3208 TA 375 hp and 415 hrs on Northern Lights 5kw generator. Excellent condition with factory upgrades: including a rare queen berth with built-in cabinets, separate shower enclosure and dual Stidd seats(new chrome package 6/2010). Hydraulic engine room hatch, Northstar 6000i GPS, simrad autopilot/depth, radar,engine sychronizers, oil change pump system, windlass system and much more. Max speed 27 knots, cruise speed 18-22 knots. Teak decks in helm area and cockpit. Recent bottom paint 2/2012, engines and generator serviced for season (oil,racors,pencil zincs etc.) 2/2012. varnish removed down to raw teak applied 2 coats of teak sealer and 9 coats of varnish-2/2012. Boat is meticulously maintained with weekly cleaning and quarterly waxing. For more info call 843-209-9778.